English: This color picture is made from images taken by the imaging system on the Galileo spacecraft about 14 minutes before its closest approach to asteroid 243 Ida on August 28, 1993, at a distance of about 10,500 kilometers (6,500 miles). The images used are from the sequence in which Ida's moon was originally discovered; the moon is visible to the right of the asteroid. This picture is made from images through the 4100-ångström (violet), 7560 Å (infrared) and 9680 Å (infrared) filters. 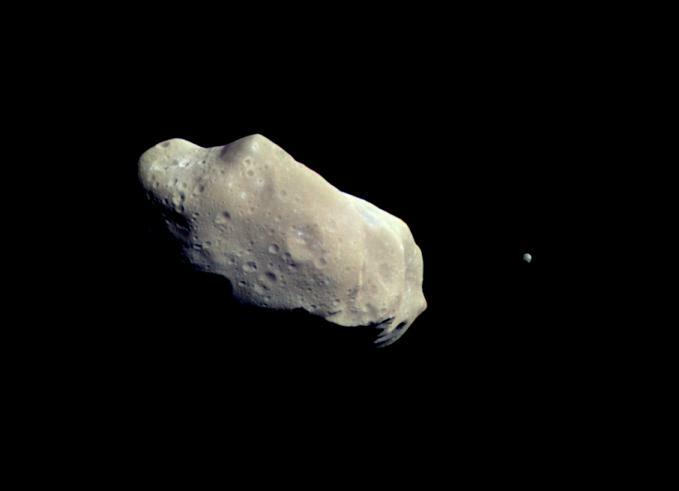 The color is 'enhanced' in the sense that the CCD camera is sensitive to near-infrared wavelengths of light beyond human vision; a 'natural' color picture of this asteroid would appear mostly gray. Shadings in the image indicate changes in illumination angle on the many steep slopes of this irregular body as well as subtle color variations due to differences in the physical state and composition of the soil (regolith). There are brighter areas, appearing bluish in the picture, around craters on the upper left end of Ida, around the small bright crater near the center of the asteroid, and near the upper right-hand edge (the limb). This is a combination of more reflected blue light and greater absorption of near infrared light, suggesting a difference in the abundance or composition of iron-bearing minerals in these areas. Ida's moon also has a deeper near-infrared absorption and a different color in the violet than any area on this side of Ida. The moon is not identical in spectral properties to any area of Ida in view here, though its overall similarity in reflectance and general spectral type suggests that it is made of the same rock types basically. These data, combined with study of further imaging data and more detailed spectra from the Near Infrared Mapping Spectrometer, may allow scientists to determine whether the larger parent body of which Ida, its moon, and some other asteroids are fragments was a heated, differentiated object or made of relatively unaltered primitive chondritic material. Magyar: A Galileo űrszonda fényképe a 243 Idáról. Jobbra halványan látszik a Dactyl.